Before issuing stock note, you have to make sure the stock note numbers are correct and comply to your company’s needs. This is to prevent missing or overlapping stock issue number when your employees start to use the system. In BMO Online Inventory Management System, you can adjust the numbers according to your company’s requirement. 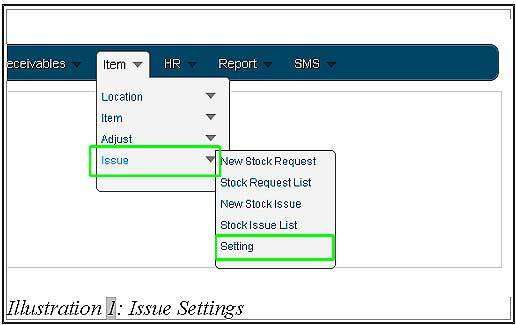 You can configure your stock issue settings by following the steps as shown below. 1. Click on “Setting” (Item > Issue > Setting) on the navigation menu bar. 3. 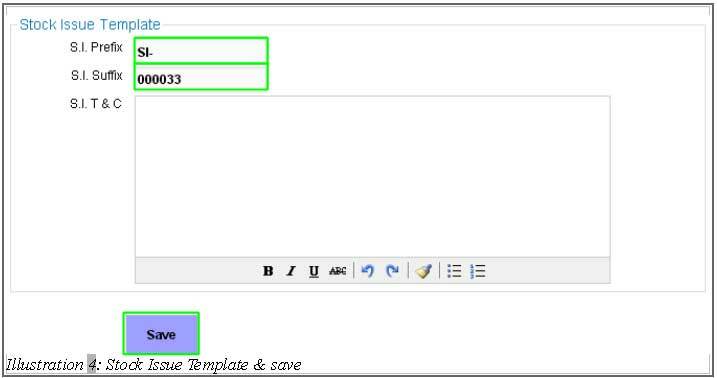 Go to “Stock Request Note Template”, you will be able to change the “S.R.N. Prefix” and “S.R.N. Suffix”. You can also change the “S.R.N. T&C” which is Terms and Conditions. But it is advisable that you leave it as default without making any changes. 4. Go to “Stock Issue Template”. You can change the “S. I. Prefix”, “S. I. Suffix” and “S. I. T&C” which is Terms and Conditions. We advise you to leave it default as well. Lastly click on “Save” button to save. 5. A window will pop up and notify you about the successful stock request note & stock issue configuration update. Click on “OK” to dismiss the message.